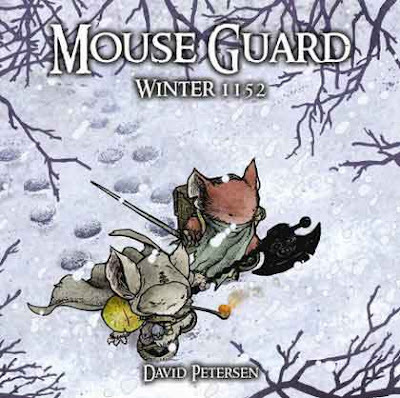 It is winter and the Mouse Guard has been betrayed. Now the defenders of the community must unite the people under one banner and defeat the mice who seek to destroy the culture from the inside. Volume two in the MOUSE GUARD series is as exemplary as any piece of literature today – be it comic or traditional. Petersen’s storytelling is not only compelling in it’s ability to bring the reader into the wee squeakers’ world, but his character development and willingness to allow a character to die for the good of the tale is beyond the norm for most books, comics or otherwise. Petersen takes his time – a characteristic I cannot stress enough in literature, television or movies. There is plenty of intrigue and medieval swordplay to satisfy the action-adventure soul, but the characters are also dimensional with faults, complexities and potential for growth. The ramifications of the death of one of the culture’s greats is yet to be seen, but we feel for the civilization’s loss and for Lieam who must silently carry the black mantle of the fallen hero and become more than he is. MOUSE GUARD is not a story but a rich mythos. Powerful. Addictive. Enthralling. Rich. None of these words do justice to Petersen’s rodent civilization. It is one of my all-time favorite pieces of comic literature and I cannot wait for the next season to begin. Mice with swords battle birds and snakes and opossums in order to keep their realm safe. That means there is mild fantasy cartoon violence afoot. Petersen does something I do not recall seeing in any other piece of comic literature. At the end of each chapter, he provides a two-page artistic rendering foreshadowing an important aspect that will occur in the following chapter. This is the perfect way to 1) keep children interested in reading and 2) a way to teach students to predict, which is an important reading strategy. Children can look at the wordless image and predict what will occur in the next chapter based on the available information. Then they can read to find out if their prediction was correct or not. From an artistic perspective, this is a way to enhance the beauty of the book and further engross the reader into the mythos. From a reading comprehension point of view, these end-of-chapter illustrations are a brilliant way to help readers engage in research-based reading strategies whether they know it or not. Read our review of MOUSE GUARD: FALL 1152.